Ignoring calls for defiance, Prime Minister Raja Pervez Ashraf is all set to appear before the Supreme Court on Monday. A five-member bench of the court has summoned the PM to personally appear before it and respond to notice regarding writing letter to Swiss authorities for reopening graft case against President Asif Zardari. Syrian opposition activists accused President Bashar al-Assad's army on Sunday of massacring scores of people in a town close to the capital that it recently recaptured from rebels. Two key allies of the Pakistan People's Party (PPP) have opposed a hawkish, and increasingly popular, view prevailing in the ruling party that the Prime Minister should not appear before the Supreme Court to face contempt charges. Background interviews with leaders of the coalition partners revealed that the Pakistan Muslim League-Q and the Muttahida Qaumi Movement (MQM) are strongly against the reported plan to abstain from the court proceedings. The Awami National Party (ANP) is yet to come out with a clear stance. Media reports said seniors leaders of the PML-Q and the MQM at their meeting with President Zardari advised against confrontation with the judiciary. According to sources in the PPP, a majority of senior party members, including former Prime Minister Yousuf Raza Gilani, during a meeting at the Presidency on Friday night endorsed the viewpoint of Attorney General Irfan Qadir that under the Constitution, the PM was not answerable to any court for his official acts. MQM's spokesman Wasay Jalil said the party's chief Altaf Hussain had already declared that the country could not afford confrontation between institutions and it believed that the courts must be respected. He said Chaudhry Shujaat Hussain and Deputy Prime Minister Chaudhry Pervez Elahi had already advised the PM that he should appear before the SC. Neil Armstrong, the US astronaut who in 1969 took a 'giant leap' for mankind by becoming the first man to set foot on the moon, died today at the age of 82. Armstrong died just weeks after he underwent a heart surgery, and his family said in a statement that he passed away following complications resulting from cardiovascular procedures. 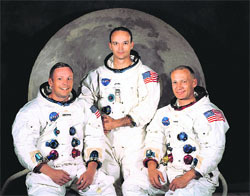 July 20, 1969, became a watershed date in the history of mankind after Armstrong, commanding the Apollo 11 spacecraft landed on the moon, and accompanied by fellow astronaut Edwin Aldrin spent nearly three hours walking on the moon. "That's one small step for a man, one giant leap for mankind," is how Armstrong had broken the historic news from the Earth's satellite when he radioed back. It had taken Apollo 11 craft, carrying Armstrong and fellow astronauts Buzz Aldrin and Michael Collins, four days to complete the nearly 4,00,000 km journey, as the world waited with bated breath. "While we mourn the loss of a very good man, we also celebrate his remarkable life and hope that it serves as an example to young people around the world to work hard to make their dreams come true, to be willing to explore and push the limits, and to selflessly serve a cause greater than themselves," his family said in a statement. "For those who may ask what they can do to honour Neil, we have a simple request. Honour his example of service, accomplishment and modesty, and the next time you walk outside on a clear night and see the moon smiling down at you, think of Neil Armstrong and give him a wink," they said. Armstrong was 38 years old when he became the first man to set foot on the moon. The development that came at a time of intense space rivalry between the reigning superpowers, the US and the USSR, gave America a major leap over its Cold War foe. As soon as the news spread, tributes started pouring in for the legendary former astronaut. "Neil Armstrong was a true American hero, both because of his extraordinary service to his country and the honorable life he led. He was a groundbreaking Naval aviator and the world's most famous astronaut, but it was his humble and gracious response to the torrent of attention that followed his accomplishments that may have set him apart most," said Ohio Senator Rob Portman. It was in Ohio town of Wapakoneta that Armstrong was born on August 5, 1930. Later on, Armstrong chose to avoid the public limelight and lead an intensely private life. He resigned from NASA in 1971 to take up teaching engineering at the University of Cincinnati for several years. In fact, his family in the statement described him as "a reluctant American hero who always believed he was just doing his job." In one of his rare public appearances at a gathering with Aldrin and other Apollo astronauts to mark the 30th anniversary of their moon landing, he recognised the importance of his achievement. More than 200 bodies, some of them women and children, were found in houses and basements around Daraya, according to activists who said most had been killed "execution-style" by troops during house-to house raids. Due to restrictions on non-state media in Syria, it was impossible to independently verify the accounts. "Assad's army has committed a massacre in Daraya," said Abu Kinan, an activist in the town, using an alias to protect himself from reprisals. The killings in Daraya, a working class Sunni Muslim town that sustained three days of heavy bombardment before being overrun by the army on Friday, raised the daily death toll to 440 people on Saturday. "A massacre," said the voice of the man who appeared to be taking the footage. "You are seeing the revenge of Assad's forces ... more than 150 bodies on the floor of this mosque."